Enjoy mingling with local notables, meet and have your picture taken with Khalilah Camacho-Ali, indulge in a complimentary adult beverage and some fine appetizers. Bring Business Cards! Fairly Flexible Summetime Attire: Summer Seersucker, Business, Business Casual or Cocktail Chic. No tennis shoes allowed. Jeans are allowed with sports coat and or fancy button down. Tee shirts are allowed with sport coat. Black-Tie is fine but not required! Dressy Casual is fine! A suit is fine! Winter Park, FL, August 13th, 2018. 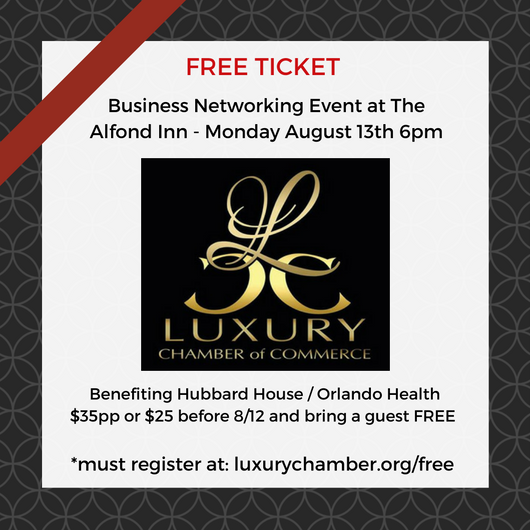 – Luxury Chamber of Commerce is pleased to announce a networking event taking place at the Alfond Inn in their lounge area. The event will present an opportunity to network with purveyors and consumers of luxury goods and services as well as philathropists, business professionals and local notables. Alfond Inn was recently voted #1 hotel in Florida by Conde Naste Traveler Magazine and is home to one of the finest art collections in Central Florida, they have over 240 pieces on display which were donated by Rollins College and part of the permanent collection of the Cornell Fine Arts Museum. Florida residents who choose to stay at the hotel can take advantage of their Monday special only $189 per room and the five year anniversary package is also available which offers dinner for two, full breakfast, a champagne and chocolate welcome reception, two boat tour tickets and valet parking. 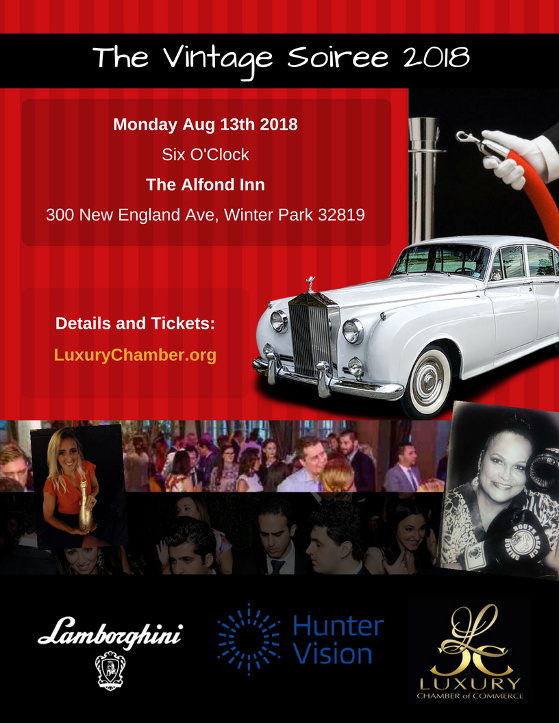 Event attendees will enjoy mingling with local notables including Khalilah Camacho-Ali the second wife of the late boxer Muhammad Ali, board members from some local non-profit institutions, actors, models, luxury real estate professionals and fine artists. Enjoy a complimentary glass of Lamborghini champagne, a cocktail from the bar as well as paired hors d'oeuvres. Patrons will know they have done the right thing by attending as a percentage of proceeds goes directly to Hubbard House which is a 501(c)3 organization providing lodging and meals to the families in crisis who have patients in trauma and critical care areas of Orlando Health. Many are international visitors and most from outside of Orange County which makes a hardship for them to travel to the hospital daily. Suggested Attire is Business or Summertime Vintage – think seersucker and be creative and fun. Dressy Hats are welcomed!